Manufactured from high quality steel sheathed in a tough polyethylene material. Designed for maximum grip in a variety of soil conditions. Has a cadmium plated bullet point tip for accurate precision allowing it to be driven into the hardest of soils. 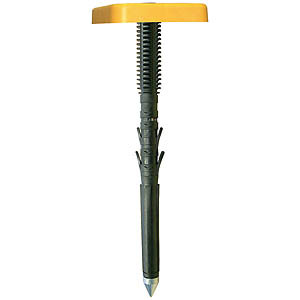 The polyethylene sheath is deeply ribbed with a series of barbed anchors to give a firm anchor in the ground. Overall diameter of the ribbed marker is 22mm. The yellow head is manufactured from high impact polyethylene resistant to high temperature changes and UV radiation. When installed the head becomes an integral part of the spike ensuring greater stability. Site data can be marked onto the head with a special marker pen. Flat Head: 100 x 100 x 20mm giving an almost flush fitting marker. Alternatively the solid aluminium reversible pyramid head from the Perma-Mark can be used. A special sealing cap is provided with each Ground-Mark which has concentric rings and a plumb point recess in the centre allowing for accurate alignment of prism poles instruments etc. No special tools needed: Simply place the marker head in the desired position and drive the Ground-Mark through the head with a standard lump hammer all that remains is to knock a special sealing cap onto the head of the Ground-Mark... Job finished. Available in two sizes: 300mm and 500mm. All heads (including the Perma-Mark) are totally interchangeable.